Turmeric is a mustard-yellow spice used in South-Asia, mostly India and Pakistan, and the Middle East. Turmeric is a spice often used in yellow curry. It gets its coloring from a compound called curcumin. The University of Maryland Medical Center found that curcumin can help to improve chronic pain by suppressing inflammatory chemicals in the body. 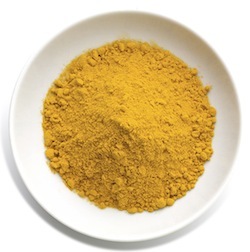 In one example, turmeric reduced the severity of pancreatitis-associated lung injury in mice. Research activity into curcumin and turmeric is increasing and there are over 2,000 publications found that mention turmeric. Make a homemade curry with turmeric or mix it into other recipes once or twice a week.